This scenario describes how a hypothetical retail business uses backups to safeguard application data and then restore the dataset after failure. The HBase administration team uses backup sets to store data from a group of tables that have interrelated information for an application called green. 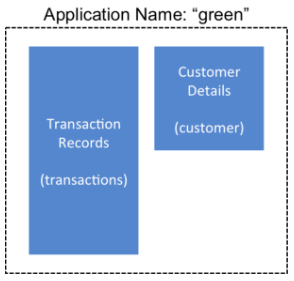 In this example, one table contains transaction records and the other contains customer details. The two tables need to be backed up and be recoverable as a group. The admin team also wants to ensure daily backups occur automatically. The following is an outline of the steps and examples of commands that are used to backup the data for the green application and to recover the data later. All commands are run when logged in as hbase superuser. A backup set called green_set is created as an alias for both the transactions table and the customer table. The backup set can be used for all operations to avoid typing each table name. The backup set name is case-sensitive and should be formed with only printable characters and without spaces. The first backup of green_set data must be a full backup. The following command example shows how credentials are passed to Amazon S3 and specifies the file system with the s3a: prefix. A catastrophic IT incident disables the production cluster that the green application uses. An HBase system administrator of the backup cluster must restore the green_set dataset to the point in time closest to the recovery objective. If the administrator of the backup HBase cluster has the backup ID with relevant details in accessible records, the following search with the hdfs dfs -ls command and manually scanning the backup ID list can be bypassed. Consider continuously maintaining and protecting a detailed log of backup IDs outside the production cluster in your environment. The admin scans the list to see which backup was created at a date and time closest to the recovery objective. To do this, the admin converts the calendar timestamp of the recovery point in time to Unix time because backup IDs are uniquely identified with Unix time. The backup IDs are listed in reverse chronological order, meaning the most recent successful backup appears first. The admin restores green_set invoking the backup ID and the -overwrite option. The -overwrite option truncates all existing data in the destination and populates the tables with data from the backup dataset. Without this flag, the backup data is appended to the existing data in the destination. In this case, the admin decides to overwrite the data because it is corrupted.